Widen your reach – National Conference meetings, with chapters in every major city, and speakers with different areas of expertise allow for a continually fresh perspective on your industry. Guest speakers discuss emerging issues and help keep you ahead of the curve. Get involved in community outreach and philanthrophy – Participate in fundraising initiatives and community service activities, and see your involvement positively impact the lives of others. Expand your network- gain professional advice and counsel from other women. WiFS will provide you with a professional head start with support, industry insight, career advice and more. Critical at every stage of your career, networking helps navigate all areas of your life- personally and professionally. Sharpen new skills for the workplace – Joining a WiFS committee will allow you to experiment with different skill sets within a non-competitive environment and use your newfound talents to expand your professional options. Get to know the local chapter by attending one of our upcoming events. Ready to join now? Visit the national site to submit an application. WIFS surveyed 800 industry females to answer the question: Why do some women achieve major success in the financial services industry and others do not? 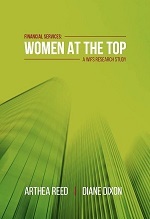 The results were compiled, analyzed and serve as the basis for the book, Financial Services: Women at the Top — A WIFS Research Study.